Laura Werlin, one of the country's top cheese experts, has written three books on the topic, including Great Grilled Cheese. Here she outlines the basics for a cheese party, from condiments to wines. How do you figure out how much cheese to buy for a party? It depends on how you're going to be serving it. 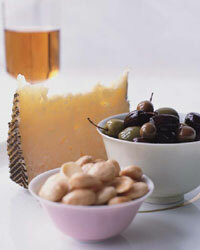 If you're focusing on cheese, you can have as many as eight different kinds and a variety of accompaniments. For this kind of party, I buy about two ounces of each cheese per person. If you're serving a cheese course as part of a sit-down meal, then you need just three cheeses, with half an ounce to an ounce of each per person. If it's a warm day, you should take cheese out about 45 minutes to an hour before serving; if it's cooler, make it an hour to an hour and a half. When you taste or serve cheese, start with the mildest on one end of the board and work toward the stronger ones. You usually want to go from softer to harder cheeses; soft cheeses are typically milder than the hard ones. If you have a strong yet soft cheese, you should serve it last. Super-runny or super-strong cheeses should get their own serving vessels. A runny cheese can go into a shallow bowl. (Don't use one made of glass; it will be really hard to clean the cheese off.) A blue cheese should go on its own board. I'll always put out something sweet, like chutneys, fruit compotes and quince paste. The combination of sweet and savory creates a whole separate third taste that's crazy-making because it's just so good. Then I might also serve nuts like candied walnuts and toasted hazelnuts as well as dried and fresh fruitfigs or slices of pears and apples, whatever's in season. And I'd have two kinds of breadtoasted walnut bread sliced really thinly and slices of baguette. Which condiments do you use with different cheeses? I just love honey with blue cheese. I know that people like varietal honeyscertainly chestnut honey with Gorgonzola is a great combination. But almost any kind of honey is delicious with a salty cheese. Quince paste is typically served with Manchego, a Spanish sheep's-milk cheese, which also goes well with Marcona almonds and Spanish green olives. And I love panfortea compressed mixture of dried fruits, nuts, honey, sugar and sometimes a little flourwith a salty, strong cheese like Reblochon (a French washed-rind cow's-milk cheese) or a sheep's-milk cheese from anywhere. What are the essential tools for a cheese party? I like using a separate knife for each kind of cheese, so the flavors don't mix. And different cheeses require different kinds of knives. For soft cheeses, I prefer a "skeleton" knife, which has holes in it to prevent the cheese from sticking. One of my favorites is by Henckelsit's both whimsical and functional ($60; 800-777-4308 or usa.zwilling.com). When it comes to a really hard cheese, like Parmigiano-Reggiano, you want a short, stubby knife with a sharp point. You use that to dig out a chunk. Cheese markers are often ceramic and T-shaped, with a point at the end that sticks into the cheese ($10 for a set of six from Murray's Cheese Shop; 212-243-3289). You write on the wide parts with an erasable pen so you can reuse them. That way, your guests will know what cheeses they're eating. I love my All-Clad fondue pot, which is stainless steel with a ceramic insert that helps the cheese stay hot ($140 from Williams-Sonoma; 877-812-6235 or williams-sonoma.com). What are some good rules of thumb for pairing wines with cheese? I'll serve anywhere from two to four winesusually two or three whites and maybe one red. I think that white wine goes better with more cheeses than red, because the strong tannins in a red tend to get exaggerated by cheese. One of the best wines for a cheese party is Riesling. It's got nice fruit and acidity, both of which are very cheese-friendly. I love to make a classic French spread called fromage fort. You put a little butter, a little wine and whatever cheese you have in the blender, and you mix it up into a spread. It's different every time, because you always have different cheeses.